To make it easier for users to manage their iPhone, various third-party tools and applications are available. If you are a regular iPhone user, then you must have tried iTunes in the past. Though, almost every user look for its alternative since iTunes isn't that user-friendly. Don't worry, you can still manage your data with an iPhone file manager. Transfer files from iPhone to PC or vice versa like a pro with these iOS device management tools. 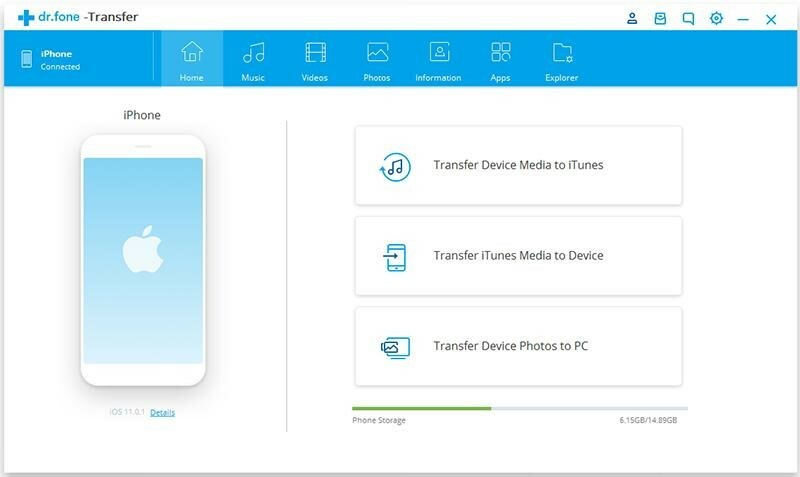 If you are looking for the best solution to manage your iOS device, then give dr.fone - Transfer (iOS) a try. A highly secure and user-friendly tool, it comes with tons of features. You can use it to manage your photos, videos, music, contacts, messages, etc. Not just to transfer data between iPhone and computer, it can also move data between different devices as well. ● The iPhone manager can be used to transfer data between an iOS device and a computer easily. ● Users can also rebuild iTunes library without using iTunes or sync iTunes content with the connected device. ● Explore the saved photos, videos, music, contacts, and messages on your device. It also has a dedicated file explorer. ● You can also transfer data from one iPhone to another iPhone or Android as well. ● Since it provides a preview of the saved data, users can perform a selective transfer. ● During the transfer process, the data is kept intact and secure. Another application that you can try is from iSkysoft. The application is quite similar to dr.fone and will you transfer files from iPhone to PC and vice versa. There is also a provision to transfer data from one smartphone to another. Since users can easily explore their iPhone storage and save their data, the application can also be used to maintain its backup as well. ● The tool is extremely easy to use and is compatible with all the leading iPhone models. ● Users can get a view of their device's storage and transfer its data across different sources. ● You can easily transfer data between iPhone and computer as well as iPhone and iPhone. ● It provides a preview of our data and lets us perform a selective transfer. ● There is no need to jailbreak the device to use the application. ● It can be used to transfer photos, music, videos, contacts, and other important data files. ● There is no need to use iTunes in order to transfer data between iPhone and iTunes. 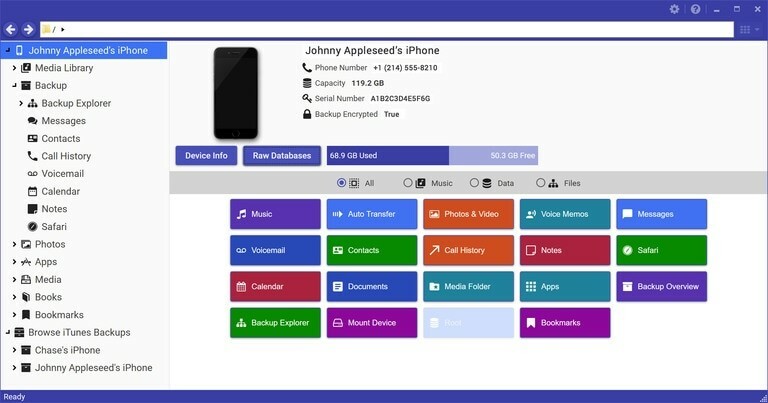 Developed by Macroplant, iExplorer is a popular iPhone file manager that will fulfill all the basic requirements of yours. It is a lightweight desktop application that is compatible with different iOS devices like iPhone, iPod, and iPad. It also supports devices running on iOS 12 as well. You can backup your data on your computer, manage your photos, view call history, and do so much more. ● The tool can let you transfer music to and from iTunes and your iPhone pretty easily. ● Read text messages stored on your iPhone and export your conversations. If you are looking for a multi-purpose smartphone manager, then you can also try SynciOS. Apart from iPhone models, it is also compatible with leading Android devices as well. You can easily use it to transfer files from iPhone to PC or any other smartphone. Also, you can view the apps installed on the device and further transfer important data files like photos, videos, contacts, messages, music, ebooks, etc. ● You can easily backup your media files and even transfer them from one source to another. ● The application allows us to transfer data from one iPhone to another or between iPhone and computer. ● It comes with different applications like ringtone maker, video to audio converter, etc. After getting to know about different iPhone managers, you can be a bit confused. To help you pick the best iPhone file manager, you can go through this quick comparison. I'm sure that after getting to know about these different iPhone tools, you would be able to transfer files from iPhone to PC like a pro. From all these tools, we recommend dr.fone - Transfer (iOS). 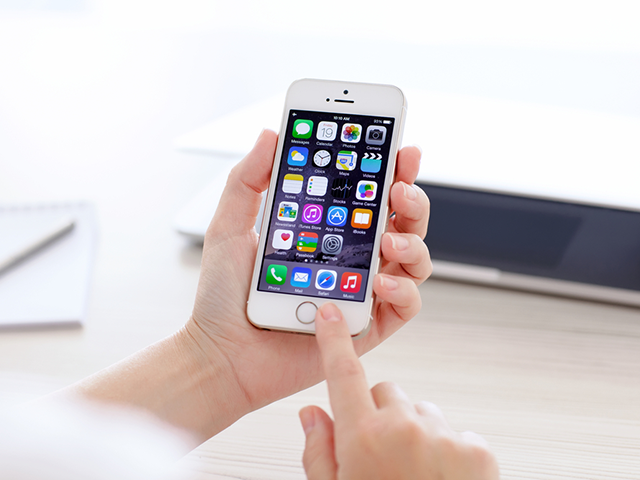 It is a tried and tested solution that lets us take a complete control of our iOS device. You can easily move your data from iPhone and computer (or other smartphones). This is why the tool is often used by experts and now you can also make the most of your device with it.